Robots in human facing environments will move alongside human beings. This movement has both functional and expressive meaning and plays a crucial role in human perception of robots. Secondarily, how the robot is controlled – through methods like movement or programming and drivers like oneself or an algorithm – factors into human perceptions. This paper outlines the use of an embodied movement installation, “The Loop”, to understand perceptions generated between humans and various technological agents, including a NAO robot and a virtual avatar. Participants were questioned about their perceptions of control in the various agents. 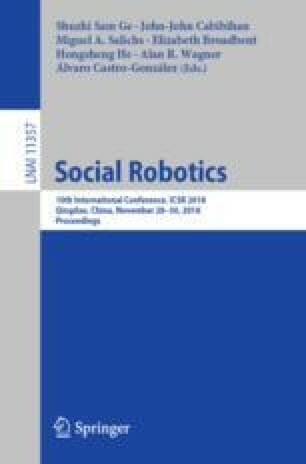 Initial results with human subjects demonstrate an increased likelihood to rate a robot and a robotic shadow as algorithmically controlled, versus a human performer and a human-shaped VR avatar which were more likely rated as human actor controlled or split between algorithm/human actor. Participants also showed a tendency to rate their own performance in the exercise as needing improvement. Qualitative data, collected in the form of text and drawings, was open-ended and abstract. Drawings of humans and geometric shapes frequently appeared, as did the words “mirror”, “movement”, and variations on the word “awareness”. This work was conducted under IRB #17427 and supported by a National Science Foundation (NSF) grant #1528036. The authors would like to thank the organizing committee of the 5th Annual Conference on Movement and Computing, which was the site of this experiment and provided production support. Novoneel Chakraborty contributed to the creation of the installation. The authors wish to thank Alexandra Bacula, Roshni Kaushik, and Cameron Scoggins for their assistance in running the experiment on site.